Mr McCormack who is responsible for the Royal Australian Mint was joined by Chief Executive Officer of the Mint Mr Ross MacDiarmid and two members of the Returned Services League of the News South Wales Corps of Guard to unveil the coin at the Hyde Park Anzac Memorial Pool of Reflection. Mr McCormack said the special coins are a symbolic reminder to encourage people all around Australia to reflect on those who made the ultimate sacrifice and gave their lives during service. “On the 99th anniversary of the Armistice which ended the First World War, the nation will observe one minute’s silence, in memory of those who died or suffered in all wars and armed conflicts,” said Mr McCormack. “Rosemary has traditionally been worn on Anzac Day and Remembrance Day as a way to commemorate those who have died in active service and other military operations. Mr MacDiarmid said the Mint had a long and proud history of marking special commemorative events with coinage playing a significant role in reaching many Australians with an important message. 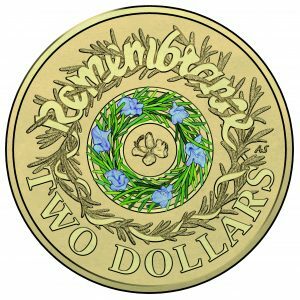 “As we near the final year of the Anzac Centenary these coins will be a lasting memory so that we continue to reflect and remember for years to come,” said Mr MacDiarmid. Coins are available for purchase from the Mint’s website. A contribution from the sale of all collectible coins in the Royal Australian Mint’s Official Anzac Centenary Coin Program is made to the Anzac Centenary Public Fund. The Public Fund contributes to a range of significant projects will help leave a lasting and unifying legacy for all Australians.